Jess Tucker sticks her neck out for a stranger-the buzz is someone in the dorm is a trans girl. So Tucker says it's her, even though it's not, to stop the finger pointing. She was an out lesbian in high school, and she figures she can stare down whatever gets thrown her way in college. It can't be that bad. Ella Ramsey is making new friends at Freytag University, playing with on-campus gamers and enjoying her first year, but she's rocked by the sight of a slur painted on someone else's door. A slur clearly meant for her, if they'd only known. New rules, old prejudices, personal courage, private fear. 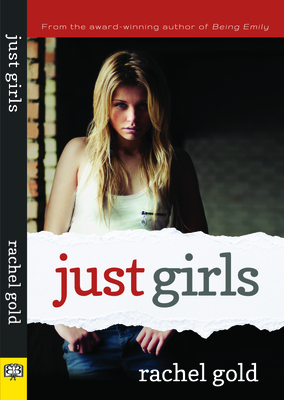 In this stunning follow-up to the groundbreaking Being Emily, Rachel Gold explores the brave, changing landscape where young women try to be Just Girls. Rachel Gold has spent seven years as a reporter, a dozen years in marketing, and holds a Master of Fine Arts in Writing degree. She worked as the senior reporter for a weekly newspaper with a readership of up to 100,000. She also served as a PR manager for an international technology company whose reach extended to Europe, Asia and Australia. She has appeared at the Minnesota Library Association Round Table speaking on young adult literature and lives in the Twin Cities area of Minnesota.